For the second time in two days, taxi drivers are protesting against the province's proposed law. Transport Minister François Bonnardel is scheduled to meet with industry reps this afternoon. For the second time in two days, taxi drivers are protesting against the province's proposed law. At dawn, cars gathered in a parking lot in Quebec City's Sainte-Foy borough, some affixed with posters announcing the continuation of the strike. From there, drivers headed out at low speeds, rolling through the Quebec City road network before converging on the National Assembly. Commuters in the capital city were faced with major traffic jams during rush hour because of the protest — some were delayed by as much as an hour as they tried to make their way through downtown. The protest against the government's plan to deregulate the industry and abolish costly taxi permits comes as industry representatives are scheduled to meet with Transport Minister FrançoisBonnardel in Montreal Tuesday afternoon. Drivers may also protest outside the Transport Ministry building, where the meeting is taking place. The Quebec-wide protest on Monday led to significant congestion in downtown Montreal and near the airport. During the 12-hour strike, drivers honked horns, waved signs and inched their way along busy roadways to disrupt traffic flow. Participating drivers refused to pick up passengers at the airport, but the impact there was minimal as travellers were still able to hail a working cab, grab an Uber or hop on the 747 shuttle to downtown. Montreal's public transit authority increased the frequency of the airport bus during the strike. 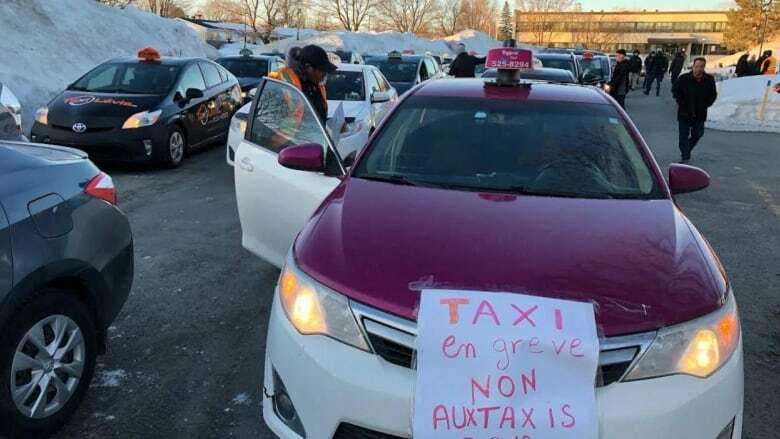 Taxi drivers say the proposed law could bankrupt the industry, but their way of protesting has sparked outrage among many Montreal commuters. Some have lashed out online, calling for a boycott of taxi services and posting memes that poke fun of the effort. Today’s taxi strike encouraged me to use Uber or STM. If you want to protest don’t do it by disrupting the customers you mean to serve in the most obnoxious way possible. The proposed law includes $500 million in compensation for drivers, earmarked to cover the losses taxi permit holders will incur under the proposed legislation. Under the existing rules, all taxis must have a permit. The price fluctuates, but on average they cost between $100,000 and $150,000. The new legislation would abolish the permits, making them worthless. The money earmarked by the government would compensate drivers for that loss. But there are about 8,300 taxi permits in Quebec, and drivers say the half a billion dollars would not cover even half of their losses. The minister said he empathizes with drivers, but a host of administrative costs will disappear with the proposed deregulation.